King’s X have confirmed they’re about to return to the studio to begin work on their first album since 2008’s XV. The as-yet-untitled record is expected to be released later this year via Golden Robot Records, after the label signed the band in December last year. King’s X will record the album at Blacksound Studio in Pasadena, California, with Michael Parnin who has previously worked with artists including Rage Against The Machine. 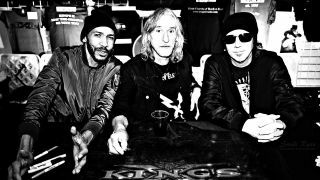 Asked how it feels to be returning to the studio after more than a decade, vocalist and bassist Doug Pinnick says: “Good question! I haven’t thought about it much, been super busy. But got a ton of tunes to submit. Drummer Jerry Gaskill adds: “It’s been a while since we’ve made a record together. I go back and forth between excitement and fear. But when it gets right down to it, I think excitement wins. Parnin also says he’s excited to work with the trio as he’s been a fan of the band since the beginning. King’s X will head out on tour across the US, Europe and the UK later this year, while further album details will be revealed in due course.